A proud graduate of Louisiana State University, Wilson is in the Baker Program’s Class of 2020. He began his career in 2012 in commercial real estate brokerage specializing in industrial and retail properties. In 2015, he transitioned into single tenant retail, managing site selection, acquisition, and development for a fast-growing automotive retail chain across the Southeast and Midwest. After Cornell, Wilson will pursue a career in distressed and opportunistic real estate investments. 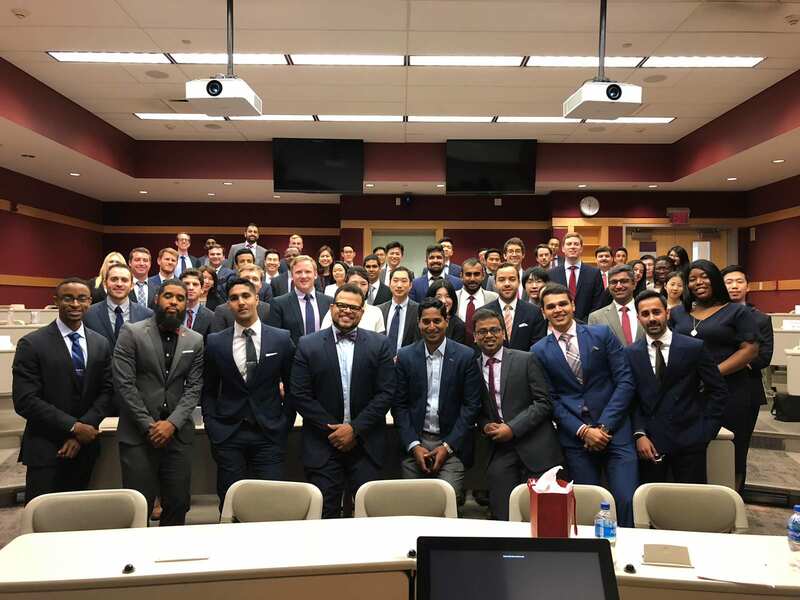 This past Thursday the Baker Program had the pleasure of welcoming back to campus Prashant Arul Raj, Head of Commercial Real Estate Finance at Guggenheim Partners. 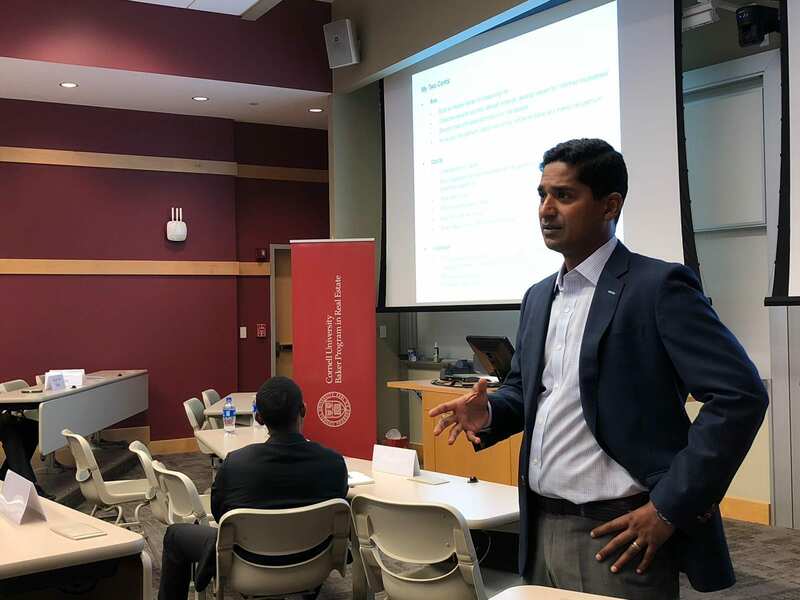 Prashant is a graduate (MPS RE ‘00) of the Cornell Real Estate Master’s program prior to its sponsorship by Richard Baker. Having been back on campus for the first time since his graduation, he had a lot to say about how far the program has come since its origins in the basement of Sibley only a year before he came to campus in 1998. During his podcast interview with the Real Estate Review and subsequent session with all of the Bakers, we were able to dive into Prashant’s career after leaving Cornell and how he progressed through the years all the way to head of Guggenheim Commercial Real Estate Finance (“GCREF”). Prashant began as an analyst with Donaldson, Lufkin, & Jenrette a mere five months prior to its acquisition by Credit Suisse. Working in CMBS originations and sales, Prashant played an important role in the growth of Credit Suisse’s business as he progressed through the ranks in the run up to the 2008 financial crisis. After originating and selling some $108 billion in CMBS products during his time at Credit Suisse, Prashant joined Guggenheim in 2009 as Head of Commercial Real Estate Capital Markets and Special Situations. Prashant was able to use his experiences during the financial crisis to move into the lending side of the business and executed a number of significant transactions for Guggenheim prior to being named head of GCREF. In discussing his day-to-day role, Prashant said he is now less focused on specific transactions and more focused on putting out fires and tackling specific items of importance within the business. Working with a $12 billion balance sheet sourced from a variety of insurance companies, annuity and family funds, GCREF originates about $2 billion in direct loans annually. According to Prashant, one of GCREF’s main advantages is its in-house servicing and asset management teams. GCREF maintains its loans to maturity and is able to tackle problems and meet the needs of its clients down to a very granular level. This has led to an impressive .5% default ratio across its lending portfolio in the last five years. Discussing the current state of the lending market, Prashant noted that as the longest running real estate cycle to date seems to be near its peak, GCREF has become more selective in its lending patterns. It is becoming much more wary of Class A multi-family investments and student housing, but still holds strong beliefs in the industrial sector, specifically distribution centers fueled by the growth of online shopping. While he acknowledged that the lending market has become more competitive, which is squeezing price and credit, terms have not necessarily changed. What he is looking out for is more leaps of faith in underwriting in the way of pro-forma cash flows. In reaction, GCREF has lowered its LTV ratios. However, due to GCREF’s position as a strong balance sheet lender, Prashant said he is not under any pressure to deploy capital, unlike many of his competitors. If the market were to turn, it would be able to turn with it. When it comes to risk, possess an “informed intuitiveness”- know your risk appetite. Your premium may be different than the market, and that is okay. As for incentives, understand what drives your decision-making and the decision-making of those around you. You will have more success if you understand other people’s incentives and motivations better than your own. The students and faculty of the Baker Program thank Prashant for sharing his engaging story and experiences as a guest of the Distinguished Speaker Series and look forward to future visits.